Oh yes. I've been following this, mostly at one or two blogs, and it is such an incredibly horrible MESS. I really really feel for the doctors over there, because their whole life, including past, with all the work to get to this point and the sacrifice involved, present, and future is being thrown in a blender without a lid to be possibly chopped, whirled around and up into the air, and then try to pick up the pieces or threads if there is one for you, and follow it to who knows where . . . . This has all the makings of a complete disaster. Not many years ago, the British government got rid of a lot of nurses, then begged them all to come back, offering all sorts of incentives and recruiting from all around the world. 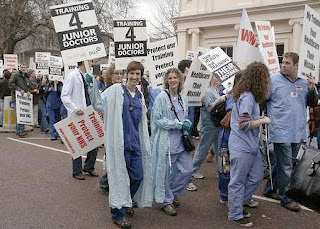 Now it is getting rid of nurses, physiotherapists and doctors, and I doubt if they will come back when needed. The powers that be have not planned. It used to be the case that British medical schools produced the number of doctors that were needed and then they were employed within the NHS. We became short of doctors and recruited overseas. Then we became short of cash, so we told non EU doctors they could only have jobs if no EU candidate was suitable. But we haven't factored into the system the fact that doctors from anywhere in the EU can legally apply for posts on the same basis as local doctors, and we have expanded our medical schools, producing more doctors. So we have more doctors than places. It was foreseeable but no one planned for it. So we dump our commonwealth doctors in favour of EU doctors from new states, because that is the current politics, and we train more new doctors than we have places for. And in a few years, after we've sent away our commonwealth doctors, and our Eastern European doctors have gone home and our own doctors have settled into other English-speaking countries that have welcomed them, we'll be begging round the world for doctors to bail us out. We'll be bloody lucky if any of them come to our aid. Since leaving the NHS for foreign parts in 2002 I have watched with awed fascination. Any guilt I harboured for the cost of my medical training has evaporated as the evolving fiasco that is (was?) the NHS has developed. All I can think is- thank the gods I got out in time. This MMC thing is incredible. I will not be coming back- the sun isnt always brighter on the other side of the world but at least I can see my hand in front of my face.